As his recent Goldman Sachs bonanza demonstrates, Warren Buffett's reputation as a financial alchemist is well-deserved. While most billionaires tend to jealously guard the secrets of their success, Buffett has generally been eager to share his thoughts. This year, the Oracle of Omaha will take his insights to a brand-new arena: grade-school playgrounds. 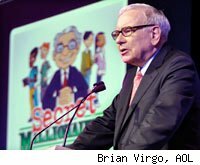 Buffett -- or at least his animated avatar -- will host The Secret Millionaire's Club, an online cartoon designed to teach children about the mysterious world of business and finance. The show, which will consist of three-to-five-minute animated episodes, will initially run on AOL (parent company of DailyFinance) and will eventually appear elsewhere. In format and length, the segments recall Schoolhouse Rock, ABC's popular program of animated educational segments that aired during children's TV programming between 1973 and 1999. Like its predecessor, AOL's web shows will also cover a variety of topics; in addition to a Buffett-branded series, it will also have programs featuring Martha Stewart, Gisele Bündchen, and even the late Carl Sagan, who hosted the smash early-'80s miniseries Cosmos. Their presence will presumably help Buffett teach children about cooking, modeling, and the universe. Like 1983's animated series Mr. T or Alfred Hitchcock's Three Investigators books, AOL's children's programs will focus on a diverse group of energetic youths, occasionally bringing in the title character to provide key information. This method makes it possible for the celebrities to educate to viewers without bogging down plotlines. And, taking cues from Blue's Clues and Dora the Explorer, the webisodes will cement their messages with games and activities intended to get viewers to interact. It will be interesting to see if the Schoolhouse Rock generation, now parents themselves, will take the opportunity to sit at the animated feet of the amazing Mr. Buffett.